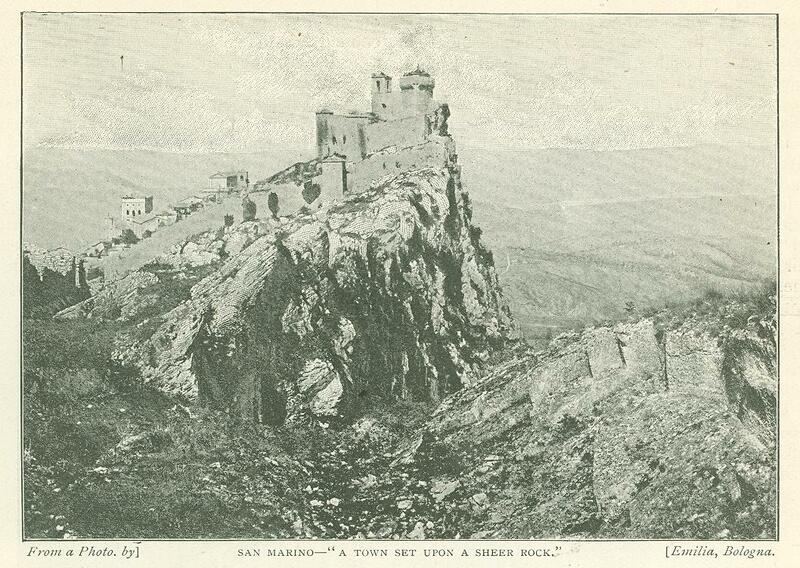 All about the Republic of San Marino. The far famed miniature Republic illustrated by photographs and described by a resident. Glamorous Europe surges around this delightful relic of the Middle Ages. When we remember that, not so very many years ago, all Italy was a jumble of kingdoms, duchies, and little independent States, and that the successful revolution of Gari­baldi and the Sardinian Government depended upon the fascination of their cry for United Italy, it seems little short of a miracle that the only survivor of the old state of things should be a republic with an area of thirty-two square miles, and a population of about eight thousand peasants, earning a precarious existence upon a rock among the Apennines. The wonders of cannibal countries, the strange prehistoric customs which still survive in the unexplored interior of other continents, are not more extra­ordinary in their way than the survival of this fantastic political freak in the middle of a very modern country, whose every aspiration is for uniformity and commonplace progress. No one has been able to explain it, but there it is, a close oligarchy, governed in paternal fashion by two Captains-Regent and a Council of Sixty, with its own medieval laws and cus­toms, living on peacefully and happily in much the same way that it has done during the last sixteen centuries. It would scarcely be more surprising if we found, on a village green in England, a specimen of some antediluvian animal long pronounced to be extinct by the naturalists, and learned that it had been allowed to live out its own existence without being; molested by yokels, shot by a sportsman, or carted off to a museum. It is strange how few people have taken the small amount of trouble required to visit this extraordinary spot. There is no difficulty whatever in reaching San Marino. Rimini is on the main line to Brindisi, and, therefore, to Egypt or India, and thousands of travelers who have passed that way must have discerned, from the windows of their trains, the three castled crags scarcely three leagues away to the west. Those few whose love for the Middle Ages has tempted them to stay and see this their last survivor have generally contented themselves with an afternoon drive, and come away with but scanty and fleeting impressions. The history of San Marino has been curiously uneventful compared, that is, with the exciting romance of the whole neighborhood. 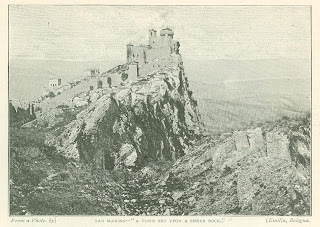 It was founded in the third century by a quarryman or, some say, a hermit named Marino, who fled there from a persecution of Christians, and appropriated the rock for himself and his friends. The fact that it belonged to someone else did not seem to disturb him, and, when the owners tried to evict him, they were struck down by a mysterious illness, and only relieved from it on consenting to make over their property "as a free gift until all time." A still narrower squeak - indeed, the narrowest squeak which the Republic ever knew - was in 1739, when Cardinal Alberoni seized the town and proclaimed its annexation to the Papacy. However, the sturdy mountaineers did not lose heart, and, when he assembled their notables in the church to swear allegiance, he was met with shouts of defiance, in which the very priest at the altar took part. The only result of this was imprisonment and pillage; but, after three months, the traditional good fortune of the Republic came to the rescue, and, by the inter­vention of Louis XV., independence was re­established. The next dangerous visitor was Bonaparte, who discovered the existence of the Republic during his Italian campaign of 1797, and good-humouredly sent a messenger to offer an increase of territory. This was prudently refused, and, far from being offended, he wrote a very polite letter, promising to exempt the citizens from all contributions, and offering four cannons and some wheat as a mark of his distinguished consideration. If he had pursued his inquiries a little more closely, the revolutionary general would doubt­less have been somewhat less amiable to this highly aristocratic oligarchy. Throughout my stay, I was constantly coming across examples of ideas which were as contrary as possible to the modern acceptance of the word Republic. 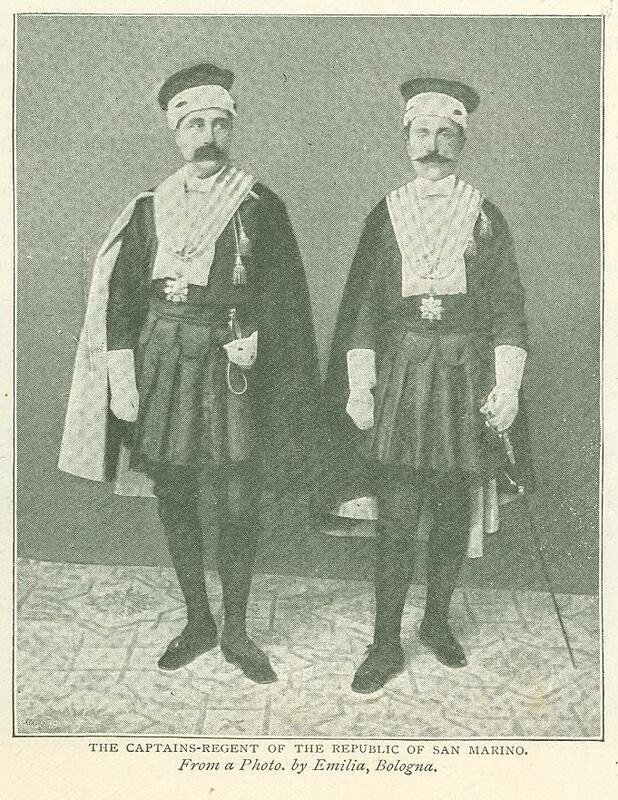 There are various orders of nobility, and the Captains-Regent maintain quite a show of ceremonial state, sitting upon a throne with a carved canopy, and being waited upon by an individual known as the Cameriere del Principe - Chamberlain to the Prince. "What Prince?" I was inclined to ask; and, though I found that it was only a convenient alias for the Sovereign Republic, it certainly struck a significant note. The Chamberlain to the Prince turned out to be the son of my landlord, and he was very useful in get­ting me access to all the sights. He even went so far as to hint that, if I were anxious to obtain a title, he could probably arrange to obtain for me a knighthood or even a dukedom, if only I were willing to pay the usual fees, which, in the case of a dukedom, would probably have been rather heavy. A title was thus conferred upon an American named Tucker in return for his subscription of £100 a year to the library of the Republic. In spite, however, of their aristocratic tradi­tions and their various Royal attributes, the citizens are seriously imbued with modern democratic notions. No doubt they find this good policy in the present age, and, after all, it is only a theory, for they take care to adhere to their old form of Government, and value their national independence more than anything else they possess. For United Italy they express an enthusiastic regard, but they take good care to have neither part nor lot in it, having a whole­some dread of its conscription and grinding taxation. My landlord, who was quite a typical citizen, after explaining at length to me the details of the Constitution, told me with great complacency that "the people" had nothing to do with the laws except to obey them; and, when I drew his attention to the words, "We demand universal suffrage," which had been scribbled up on some of the walls, he replied indignantly that that was merely the work of a few coffee house babblers, and did not represent in any way the sentiments of the citizens. The Republic is a good deal easier to leave than to visit. A citizen of the Republic may rise early, take the diligence to Rimini, and return home the same evening after attending to his business in Italy. 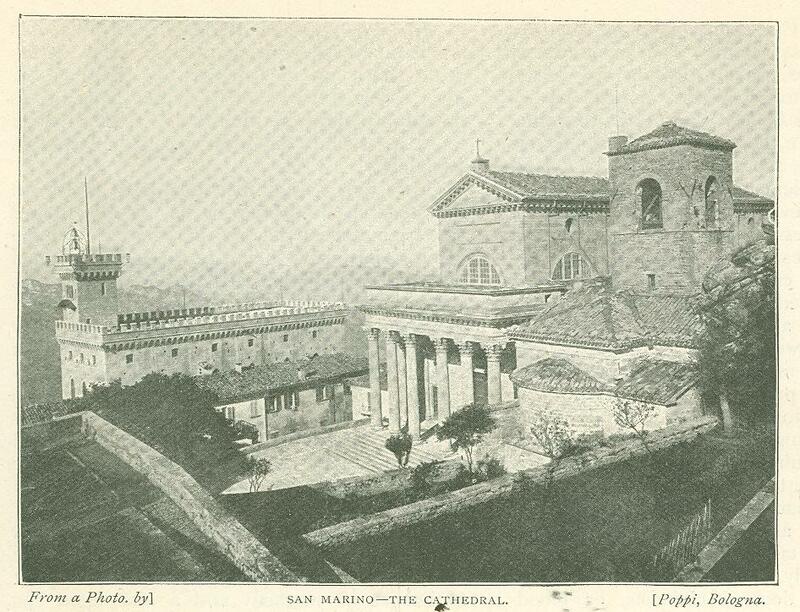 But an Italian desiring to see San Marino must make up his mind to spend the night there unless he goes in his own conveyance. The roads are rough and hilly and, for the last portion of the way, indulge themselves in wearisome zigzags. The pace of the diligence is disheartening - three hours to do three leagues - and the thick clouds of white dust do not improve the temper. But the driver proves delightfully garrulous, and time flies faster than the horses. San Marino itself stands out against the horizon for the greater part of the way, grow­ing more and more imposing on closer acquaint­ance. Scarcely anywhere else in the world :nay you see a natural rock so fantastic in its appearance. Every detail bears out your con­viction that it must be the fastness of some medieval robber duke, if not the abode of a giant ogre. Presently, as we cross a little stream, the driver gives a loud crack with his whip and exclaims, triumphantly, "Ecco! we are now in the territory of the Republic." Some authorities have sought to identify this stream with the ancient Rubicon, and it is certainly strange if that has remained a frontier down to the present day. The inscription on its bridge suffices to convince you that you have strayed back into the old times. On one side of it are the letters "R. S. M." (Republic of San Marino); on the other you may still discern the arms of the old Papal States. Where else in Italy would this have been allowed to remain? But no one seems to trouble about San Marino; and the strangest instances of forgetfulness might be quoted with regard to it. For instance, when Austria made peace with Italy, she forgot that the Republic of San Marino had also declared war upon her, so no separate peace was concluded, and, strictly speaking, the tiny Republic still remains at war with the Dual Monarchy. The real business of the ascent begins at the frontier village, and, after one more long delay for rest and refreshment, we are supplied with an extra horse, and proceed to climb the hill at a snail's pace. Our next stopping - place is Borgo, a flourishing village at the neck of the hill, just before the ascent begins to be serious. This is the aristo­cratic part of the town, where the nobles and other rich peasants re­side, and the best of the humble shops are to be found. It has a modest inn, where a traveler would probably do better to alight, but the driver immediately decides for me that I must go on to "Bigi's," at the top. That is the resort of all intelli­gent travelers; for Bigi understands foreigners, and shows them all that they should see. So to Bigi's I determine to go, and we proceed up an. endless zigzag to a pretty terrace with soothing trees and creepers, where the young men and maidens of the Republic are enjoying their evening stroll. At last we find ourselves outside a fine old gateway, where a crowd of loafers awaits the arrival of the diligence, evidently the event of the day. The driver greets his wife, and bids her shoulder my bag and conduct me to Bigi's, which turns out merely a peasant's cottage, with a bush hung up outside it to show that it is a place of entertainment. Food and every necessary have, however, to be obtained all the way from Borgo, and the accom­modation is of the most primitive character, though Bigi could not have been prouder of a palatial caravanserai. Outside his house is a little square with a wine shop, a chemist, and a pump, forming an obvious resort for all the gossips of the Republic. It becomes one of my chief amusements to lounge at my windows and take in with eyes and ears the cheerful, happy-go-lucky, uneventful life of the Republic. On the left is a great rock, with houses looking giddily down more than 100ft. from the summit, where a number of laughing girls are eagerly letting down baskets by a string to receive fruit from an itinerant vendor below. As a town, San Marino. would be very like any other remote corner of Italy but for the consequences of being set upon so sheer a rock. Each street is either a precipice or a stair­case, and would recall parts of Val­letta, but that it strays very far from the perpendicular. On the way down to the entrance ­gate is a coffee­house with an inscription to the effect that: "On the 31st of July, 1849, Joseph Gari­baldi, hard pressed by the German arms, refused the conditions of sur­render, reserving himself for better times. "Nowadays, he is as much of a hero to the Sam­marinese as he is to the most ardent Italian. But when he visited them in 1849, they were by no means so pleased to see him as they would have us believe today. Not having yet afforded them­selves the amusement of declaring war upon Austria, they pleaded the neutrality of the Re­public when Garibaldi proposed to pass through their territory. He was, however, in no mood to consider punctilios of international law, and next morning he forced his way in and demanded food and shelter. The Republic was now in a quandary, with several hundred ragged red-shirts clamoring within its walls, and Austrian bayonets glittering upon the neighboring heights. The Captains-Regent attempted to play the role of mediators, but the Austrian terms were too severe for Garibaldi, and he preferred to make a dash for it with 200 picked men across the hills to Venice, leaving the Republic to explain her connivance to the Austrians as best she might. Altogether, the incident was not so agreeable as is now sought to be represented. Garibaldi's letter is, however, preserved among the greatest treasures of San Marino, and runs as follows: "Roman Republic. 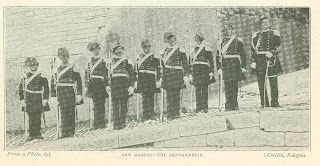 Command of the 1st Italian Legion. 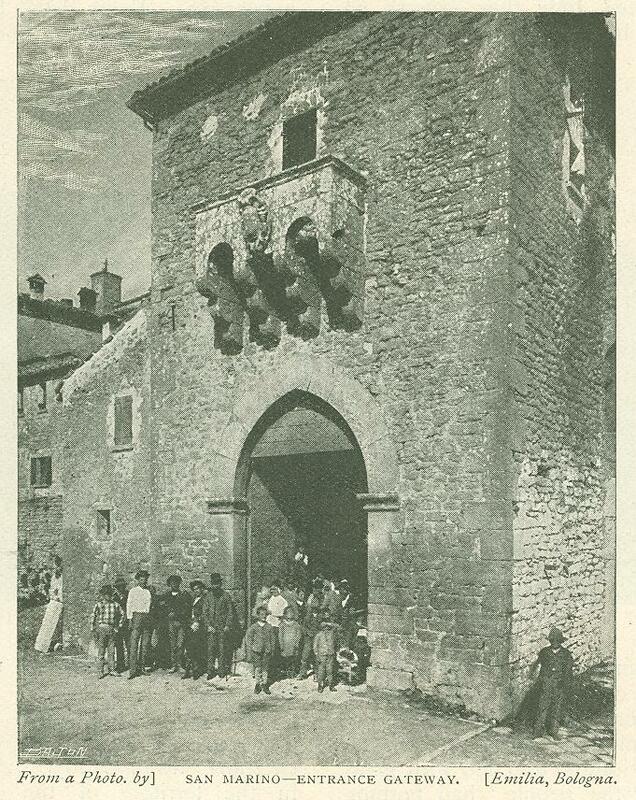 San Marino, 31st July, 1849 - Citizen repre­sentatives of the Re­public, the conditions imposed upon you by the Austrians are not acceptable, and we will therefore quit the territory. - J. GARIBALDI." 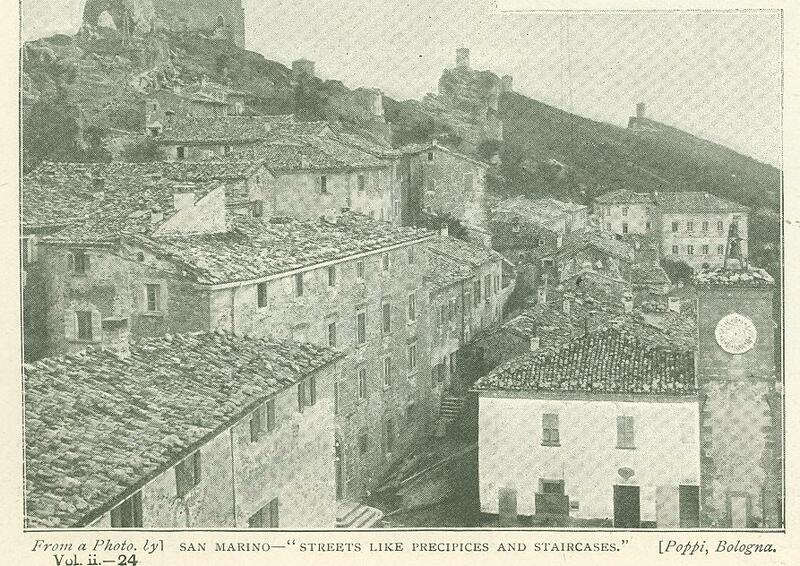 From Bigi's square I ascend a winding staircase - street and find myself in a big open place, commanding an immense panorama or rocks and wooded valleys stretch­ing away to the Adriatic. It enables me to realize what an eagle's nest I have invaded, but the view is monotonous and suggests second rate stage scenery. In the middle of the square is a - gaunt statue of Liberty; which figures con­spicuously upon the postcards of San Marino. At one end is the post office, with the standard measures of the Republic on the stone let into the wall. The post office is one of the institutions of which the citizens are most proud, and they derive quite a respectable portion of their revenue from the sale of their various issues to collectors. I have before me a long printed document, issued by authority, setting forth the style and price of all stamps, both obsolete and in present use. In 1894 there was a special commemorative issue, by which they made a handsome profit. The Republic has also issued a number of pennies and half­ pennies, which are accepted as currency in Italy, but these are rarely to be met with in San Marino itself, where the ordinary Italian paper is the regular currency. At the other end of the square is the Govern­ment palace, a gaunt, grey brick building, with two of its walls standing sheer from the side of the precipice. To look out of its windows is one of the giddiest experiences I know. The council chamber is of severe ecclesiastical aspect. On one wall is an elaborate fresco of' no particular artistic pretension. In the back­ground it has a view of the three turreted peaks of San Marino; in the foreground a variety of medieval personages are doing homage to the saint himself, who is being wafted upon a cloud attended by a couple of angels. 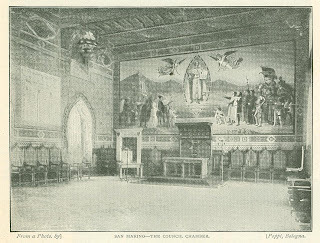 In front of the fresco is the throne of the Captains-Regent, which, with an array of standard candlesticks, a dais, a long desk, and the fresco, might easily be mistaken for a simple form of altar, while the rows of armchairs along the walls suggest cathedral stalls of a primitive pattern. The library or museum, which was a council chamber before the erection of the present palace, is perhaps most remarkable for its con­fusion. There are some 11,000 volumes, the greater part modern works of no importance, all in the utmost disorder and destitute of a catalogue. A Madonna by, Giulio Romano jostles a portrait of George Washington; an ugly medallion of Victor Emmanuel chaperones a modern allegorical picture of the saintly Founder conferring liberty upon a buxom maiden, intended to represent the Republic. The people of San Marino seem to, have no sense of proportion, for as much store seems to be set by trumpery coins, medals, ribbons, and various documents relating to Victor Emmanuel or Louis Napoleon Bonaparte as by an old charter of the year 885 and a document signed by Caesar Borgia. After this there only remains to visit the cathedral and the three dovecote castles, which figure on the ubiquitous coat of arms, and are so particularly characteristic of the place. The cathedral is a large bare building containing a life-size statue of the saint and a gilt bust, said to contain some of his remains and elevated on the occasion of his feast day for the adoration of the populace. Two of the castles are little more than ruins, and the third is now used as a gaol. With its smiling garden it must render imprisonment almost a pleasure, and so the gaoler seems to think, for when I part from him he expresses the somewhat alarm­ing hope that we may meet again. 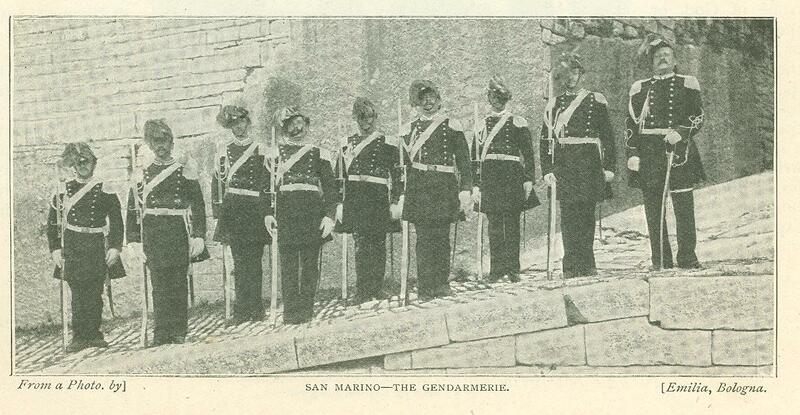 I am fortunate enough to be present at San Marino on one of the national holidays, and accordingly enjoy an opportunity of observing a march past of the whole army, which consists of 124 soldiers, who, like the people of another Republic, appear to be "mostly colonels." Some of the uniforms with their cocked hats and plumes are distinctly magnificent, and every man struts about with as ferocious and self ­satisfied an expression as any Prussian veteran. I understand that honorary rank in this army, conferring a right to wear the uniform, is as easily obtained as the titles of nobility. The laws and Constitution are not the least remarkable points about this extraordinary little State. The Captains-Regent are elected in April and October by the Council; one of them must always be a nobleman and the other a commoner. In the photograph it is the less distinguished one, standing to the reader's right, who is the nobleman; but perhaps a closer inspection will reveal the fact that the commoner appears less at his ease. The Council of Sixty comprises twenty nobles, twenty citizens, and twenty countrymen, and, whenever a vacancy is created by death, the remaining councilors elect a successor. All legislative and executive powers belong to the Sixty, who govern the State in true paternal style. There are regulations prohibiting locksmiths from selling latch-keys to young men, determining the opening of drinking shops and billiard saloons, and forbidding games of chance either in public or in private. In this connection may be men­tioned the fact that the Republic is very proud of having refused a concession for the establish­ment of gambling tables, although this would, no doubt, have greatly assisted the Budget. There are fines for "doctors, chemists, or blood­-letters revealing professional secrets;" for people disturbing Roman Catholic services, but not those of heretics; and for "usurpation of public esteem," by taking unauthor­ized titles. There is imprisonment of one to three months for "curs­ing the most holy name of God, or the Holy Virgin, or the Founder of the Republic," and for" breaking out. into invectives on the publication of a law"; while to write or speak in favor of a dissolu­tion of the Council exposes a culprit to ten years penal servitude. Special licenses are required for growing tobacco, keeping she­ goats, going up in balloons, or climbing the town walls. It would be rather amusing to present a humble petition to a Council of Sixty for leave to climb the town walls of a Sovereign Republic. How long will the quaintest State in Christendom be spared by its big neighbor? The beginning of the end will come when some enterprising tourist agency persuades the Council of Sixty to sanction a railway and provides cheap tickets to the Republic. Already many travelers in Italy must have regretted their omission to explore the strangest group of villages in the whole peninsula, if not in Europe, and, for a time, no doubt, San Marino would derive a handsome profit from their advent. But once this had led to its natural consequence, and the little old wizened Republic had been swallowed up in the great parvenu kingdom, the whole attraction would be gone, and San Marino, bereft of her special privileges, would once more be forgotten by the world. Already politicians at Rome speak of her as an anomaly and a blot upon the unity of the country, and in 1895 the Italian Government de­nounced the treaty of protective friendship, which it concluded in 1872. Long may this happy and contented people be spared the intrusion of modern progress! We may smile over what in these days may strike us as an atmosphere of comic opera, but we cannot refuse our tribute of admiration to the rugged virtues and the simple felicity of the last survivor from the heydays of romance. Originally published in the Wide World Magazine. November 1898.